Chanteur et guitariste Bluegrass né Stuard Lesley Pack, le 8 Novembre 1928 en Virginie. Early bluegrass player Buster Pack, whose name sounds like a garbled order to mutilate a knapsack, was born Stuard Lesley Pack in the hills of Russell County, VA, where he began picking guitar at the ripe old age of four. By six, he had already won a fiddler's contest held at a Reno Circus in Dante, VA. In this Dante's Inferno of youthful pickers, he whipped Ralph Stanley of the Stanley Brothers for top honors. Pack played music constantly throughout high school and college, starting up a radio program with Jesse McReynolds of Jim & Jesse fame while his buddies were still worrying about making the football team. He served in the Navy for several years beginning in 1948, and wound up being sent to both Tsingtao and Shanghai, in other words a long way from home. When Pack got back, he began recruiting a band, the Lonesome Pine Boys, with players such as fiddler Jimmie Farmer, mandolinist Red Ratliff, banjoist Red Cooke, and bassist Blake Steltner. The all-American aspect of bluegrass most likely kept Pack from being drawn into an anti-Communist witch hunt, because after all he had two "Reds" in his band. The group's initial recording efforts included cutting sides for the important Rich R Tone label, a one-man operation that pioneered the distribution of bluegrass music throughout the Appalachians. This label was not seeking to document this or that "folk" or "old-time" sound, but instead simply cut sides of the music that was being played by the active local bands of the time. One of the concoctions Pack and his buddies came up with for this label wound up earning them a place in the Rockabilly Hall of Fame, despite the fact that the group's music was largely bluegrass with a touch of gospel thrown in. 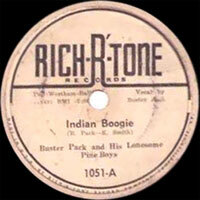 The single that is of interest to rockabilly collectors was entitled "Indian Boogie," and was recorded in Kentucky in 1952. Trying to come up with a Native American sound, Pack's pack created chopping, plodding guitar work that almost sounds like it is on the wrong speed, topped up with obnoxious hollering, wailing, and occasional grunts of "ugh!" (From the musicians, but perhaps listeners as well). Judging from this record, one would think the players were packing tomahawks in their instrument cases. The track has been made available on several rockabilly compilations. The more common bluegrass sound of the group became familiar over many Appalachian radio stations such as WYCB and WFHG in Bristol, WJHL or the "barrell of fun" station in Elizabethton, and WNVA in Norton. Pack did more than play bluegrass on the radio, winding up as a news announcer on a station out of Grundy, VA. He kept a hand in the music business, for example performing at the Louisiana State Fair in Baton Rouge, until the early '70s. The date and place of his death remains unknown. The Jansport backpack company actually created a model called the "Buster Pack," but has not identified it as a tribute to a wonderful traditional bluegrass artist. Pack's grandson Shane Pack runs a website devoted to songwriter John Prine, and is actively seeking information and memorabilia about his grandfather.